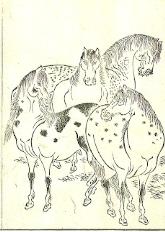 Today I shall consider beautiful edge contours of the horse. In particular, I shall look at those of the chest and front limbs. 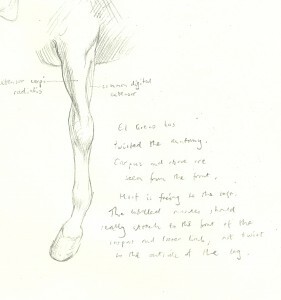 I’m currently thinking about the beauty of edges, and am also looking ahead to next month’s equestrian life drawing class. As an artist standing in front of a real, breathing horse, the two things that initially strike me are the sheer chunky volume of the animal, and the beautiful elegance of its edges. When attempting to draw the creature as it moves, my instinct is to get those flowing edge lines down in my sketchbook as fast as possible; the curve of the neck, the sweep of the belly round and up as it merges into the back, the curve of the shoulder and haunch. The horse silhouette is instantly recognisable and, perhaps, inspiring. His head carried proudly on an arched neck could symbolise pride, strength and elegance. Dressage trainers look at the moving horse’s “outline”, which is the term they use for the sweeping curve over the top of his back and neck, using this in conjunction with his leg action to help decide how well he is carrying himself. The groove between these right and left pectoral muscles is in the midline. You can make the most of this midline groove to clarify which way the horse’s body is facing. This groove shows the viewer where the front of the ribcage is pointing. Whichever way he twists his neck, limbs and tail, that midline groove is going to stay central. 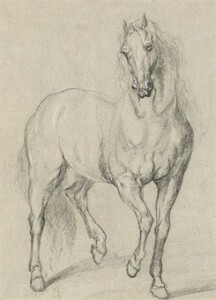 The elegant curve on the outer part of the horse’s upper forelimb appears to be made for artists. 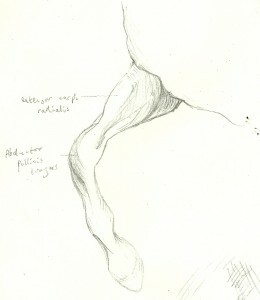 This convex sweep of flesh is actually made up of two muscles, the common digitial extensor is on the outer aspect of the leg, and the extensor carpi radialis is at the front. 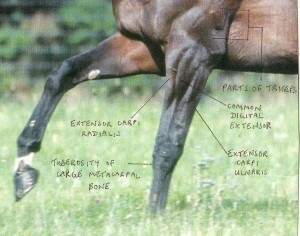 This is often seen and painted as one curving shape though, as you can see from this photograph, the individual muscles may become apparent in a fit horse when weight is put on the leg. So, which muscle are you actually representing when drawing the upper forelimb with a calligraphic sweeping line? 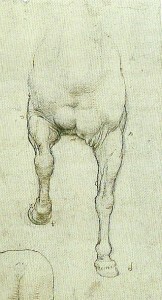 If it is a side-view of the horse, you will be drawing the ext. carpi radialis at the front of the leg. When viewed from the front, the curve represents the common digital extensor. Simon Barnes writes that “the contrast between the sleek sublimely maintained horse and the skin-and-bones beggar is the story of the saint’s conversion”. On the other hand, it appears to me that the figure of the beggar is deliberately made to echo that of the horse. Look how El Greco has distorted the muscles of the forelimbs (they are all there, just twisted around a bit) so that they resemble the arm and legs of the poor man. 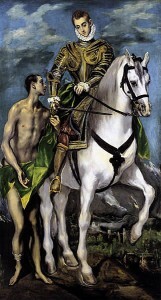 The horse and beggar almost appear to be one creature rising up on six legs, while the painting of the clothed wealthy rider is handled more rigidly. Of course, there is no need to learn muscle names. I am just including a few of them for anyone who may be curious. The joint in the middle of the front leg is called the carpus. The diagonal band of muscle and tendon that crosses the front of this joint is the abductor pollicis longus.